There are plenty of reasons to travel to Argentina. As the third most populous country in South America and the largest Spanish-speaking country in the world, Argentina has distinct and beautiful geography, interesting history and culture, thriving nightlife, and unique local cuisine. It's no wonder why Argentina attracts thousands of visitors every year. Here are a few reasons why tourists can't get enough of Argentina, and why you might want to plan a visit soon. It is a special treat to drink a glass of wine in the same city in which its grape was grown. Argentina is the sixth largest wine producing country by volume, so these opportunities abound. You can enjoy an aromatic Torrontes in Salta, a classic Cabernet Sauvignon in the north, or a meaty Mendoza Malbec in the central region of the country. Many Argentine wineries offer wine tours and tastings. "Poor Niagara!" These were the words Eleanor Roosevelt reportedly said when she visited Iguazú Falls for the first time. The term "Iguazú" means "great waters" in the Guarani language. The falls were established in 1984 as a Natural World Heritage Site by UNESCO. Along with Nahuel Huapi National Park in Patagonia, Iguazú Falls is among the most frequented tourist sites in Argentina, and for good reason. Visitors can enjoy the awe-inspiring views of the falls along with tours, treks, and water sports at the falls' base. When expats, portenos (one who lives in a port city), and tourists want to escape the hectic pace of Buenos Aires, many make the trip to Tigre Delta for a relaxed atmosphere surrounded by nature. The City of Tigre is located on the Parana River Delta and is made up of hundreds of islands dotted with family homes and weekend houses. Some of the larger islands, like the Martin Garcia Island, have towns with small airports, museums, camping spots, and other tourist attractions. Water sports enthusiasts can enjoy fishing, kayaking, and boating through Tigre’s maze of channels. Beautiful boutique shops line the streets of Palermo Soho, a hub of the relentlessly creative design district in Buenos Aires. Be prepared for long strolls interrupted by halting stops to gawk at window designs. The shops have everything from high-end shoes and belts, chic skirts, and dresses to glittery custom jewelry and stylish jeans. There also seems to be a custom shoe store around every corner in Palermo Soho, all filled with unique designs. Palermo also has dozens of cafes, bars, and restaurants catering to nearly every palate. You won’t go hungry in this part of Argentina. A country that always takes an opportunity to celebrate, Argentina has many different kinds of festivals. Buenos Aires is a host to festivals throughout the year including the Buenos Aires International Festival of Independent Film (BAFICI); Fashion Buenos Aires which celebrates fashion in a week-long event twice a year; La Rural, the nation's two-week farm fair and gaucho festival; and a gay pride parade. There are festivals celebrating art, music, and the tango as well. Jujuy celebrates the “Semana de Jujuy” when the usually quiet city comes alive for a week of partying to celebrate its founding. In Villa General Belgrano (near Córdoba), Oktoberfest is celebrated during the first two weeks of October with an enormous beer festival that celebrates German culture. In 1981, Glaciers National Park was inducted as a UNESCO World Heritage Foundation site. The glacial activities in the park are mainly visible around two lakes, Argentino and Viedma. At these lakes, you can see spectacular shows of glaciers dumping chunks of ice into the chilly glacial waters below. The park is located in the area known as Austral Andes in Argentina, on the Chilean border. You can take horse rides through the natural beauty or relax at estancias (ranches) nearby. Argentina has the world's second highest consumption rate of beef, at more than 100 kilograms a year per capita. What makes Argentine steaks so tasty? Many beef producers in Argentina still use the older methods of pasture and grass feeding their cows. This is a more expensive process, but the cows are healthier and, so it is said, the beef is tastier. 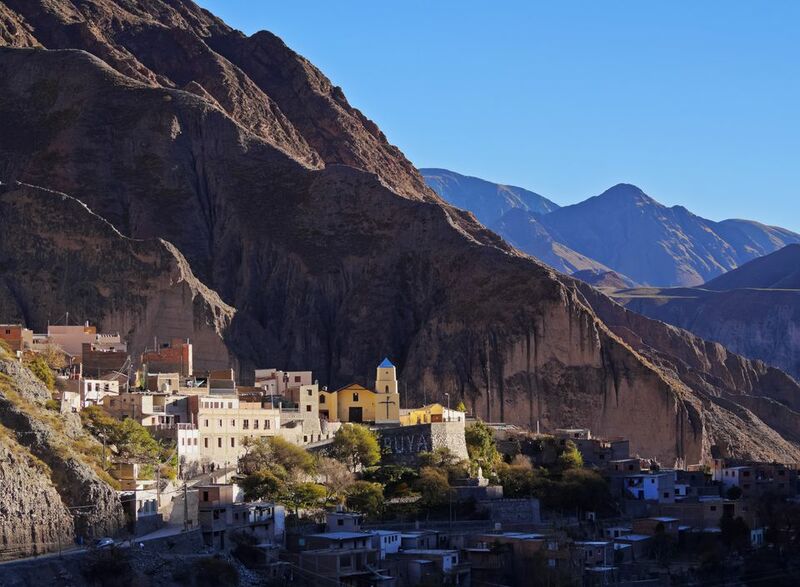 The city of Salta offers a wealth of experiences from the natural wonders of its geology to the delight of its local foods, to an interesting culture and history. Tourists can enjoy guided tours through the Calchaquí Valley or venture out to see the multi-colored rock formations and the quiet adobe villages. The Salta region is also known for its delicious wines and traditional fares such as humitas, locro, and empanadas.